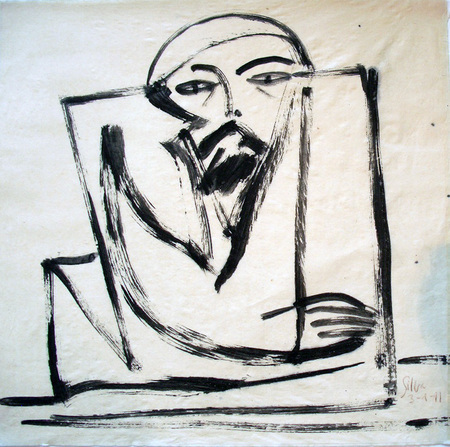 This portrait of Argentine novelist and short story writer Julio Cortázar (1914-1984) was created from memory by his Argentine friend and frequent collaborator Julio Silva (born 1930). They met in Paris, where Cortázar moved in 1951 and Silva shortly after in 1955. Their first published collaboration came in 1966 when Silva provided lithographs to complement Cortázar’s Les discours du Pince-Gueule. They worked closely on the collage books, La Vuelta al Día en Ochenta Mundos (1967) and Último Round (1969) and then Territorios (1978). In 1976, Cortázar dedicated Silvalandia to the artist, who provided the illustrations.